Portugal-citizenship.info provides information about the Portugal Citizenship by Investment Program. Contact us to learn more about the Portugal Citizenship by Investment Program. The following are questions frequently asked about the Portuguese golden visa/citizenship program. If you don't find your answers here, please contact us at your convenience. Q: What is the "Portugal Golden Residence Permit"? A: In October of 2012 Portugal introduced a new type of visa and residence permit for investors known as the "Golden Residence Programme". The essential purpose of this new law is to facilitate foreign investments in Portugal made by individuals that are not citizens of the European Union. Q: What are some of the reasons the Portuguese Golden Visa program is attracting so many international investors? Applicants may file for Portuguese/European citizenship after five years of residency if desired. Further, the residence permit grants the holder the right to work (independently or under working contract), the right to an education, access to the public health system and access to the courts. Q: What is the minimum investment required to obtain the "Golden Residence Permit"? C. The creation of at least 10 new jobs registered with the social security department. The applicant must choose one of these three investment options at the beginning of the application process. If selecting the real estate option, the investment cannot be financed through a loan/mortgage - it must be a cash investment. Further, the investment must have been made after 8/10/2012 which is the date on which the law became effective. Real estate purchases prior to this date cannot be applied. If selecting the capital transfer option, the funds are to be held in a financial entity authorized to operate in Portugal. We can assist you with opening the required bank accounts. A: Your are free to select whichever property you wish to purchase; residential, commercial or land. Your investment can be in one property or a portfolio of multiple properties as long as the minimum investment is met. The investment may be structured as a rental property, allowing you to stay the required average of seven days per year in your property while renting it out and earning income during your absence. Q: Can you help me find real estate in Portugal? A: Yes. We are associated with several licensed real estate agencies in Portugal and would be happy to help you find your ideal property that fulfills the program's real estate investment requirement. Our professional relationships and the agents' local presence in Portugal guarantee to our clients a smooth, comprehensive service that includes identifying suitable properties, providing transport for property viewings, drafting/reviewing legal contracts, and/or liaising with local notaries and architects as needed. 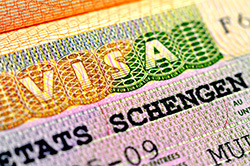 Q: Once I obtain the visa, do I need to travel to Portugal for a minimum number of days during the year? A: Yes, the program requires a minimum stay of only seven days per year, on average. Specifically; the first year minimum stay is seven days. The minimum stay during the second residency period (Years 2 and 3) is a total of 14 days (consecutive or non-sequential). The minimum stay during the third residency period (Years 4 and 5) is also a total of 14 days (consecutive or non-sequential). Q: Once I want to apply for citizenship, do I need to move to Portugal or live in Portugal for a minimum number of days during the year? A: No. Once citizenship is granted, there are no residency requirements. A: The application takes approximately two months to process after all documentation has been filed and the required investment is made. Q: How long can I stay in Portugal with my golden visa? A: The Golden Residence Permit is valid for a period of one year after issue and renewable for two subsequent periods of two years, resulting in a total of five years. After residence in Portugal for five years it is possible to file for citizenship. Q: Does the Golden Residence Permit authorize me to work? A: Yes. The Golden Residence Permit authorizes you to live and work in Portugal. Q: Can I keep my tax residence outside Portugal? A: Personal taxation for non-residents on Portuguese-sourced employment and pension income is charged at a preferential rate of 25%, although interest and rental income, dividends and capital gains are taxed at 28%. Income derived from a foreign source and relating to employment income, pension income and business and professional income can be subject to exemption. Portugal does not apply a wealth tax. There is no tax on gifts or inheritances between parents, children and grandchildren. The Portugal Golden Residence Permit Program requires an investment of EUR 350,000 in real estate, or the transfer of 1 Million Euro, or the creation of 10 new jobs in Portugal. After five years of Portuguese residency, citizenship can be applied for. Q: After I am granted citizenship and receive a Portuguese passport, will I be able to travel to the United States with my Portuguese passport? Please contact us for a detailed cost estimate or confidential consultation. Our associated attorneys are ready to assist you with attaining your investment objectives and answer any questions you might have about the Portugal Residency / Citizenship by Investment programs. Portugal (EU) Golden Residence Permit. Residency from EUR 350,000. Portugal (EU) Citizenship. The investor may apply for Portuguese (EU) citizenship after 5 years of residency.